Ken's play is going to DC...and the video's going too. 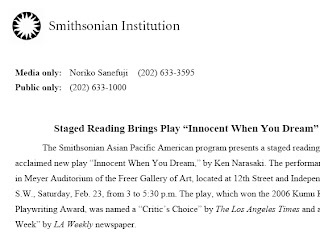 To mark the 66th anniversary of the signing of Executive Order 9066 by President Franklin D. Roosevelt which led to the incarceration of 120,000 Americans of Japanese ancestry during World War II, the Smithsonian APA program presents the critically acclaimed new play, Innocent When You Dream, by Ken Narasaki. Fresh from its Los Angeles world premiere, the cast arrives intact to present a staged reading of their production, which was named a "Critic's Choice" by the Los Angeles Times and a "Pick of the Week" by LA Weekly, and won the 2006 Kumu Kahua Pacific Rim Playwriting Award. A Nisei father lies in a hospital bed, only partly aware of his two adult children who have arrived at his bedside, unsure their father will survive. While the father returns to his interned past searching for a lost first love, his children bicker and argue, not quite ready to let their last parent go. 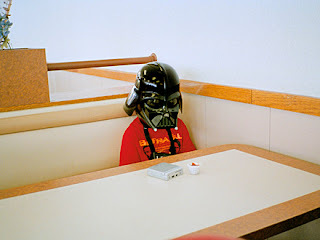 Thanks to my friend Karim over at Logicalnot for turning me on to FFFFound.com, a really great place to wander around and a great place to get design ideas.